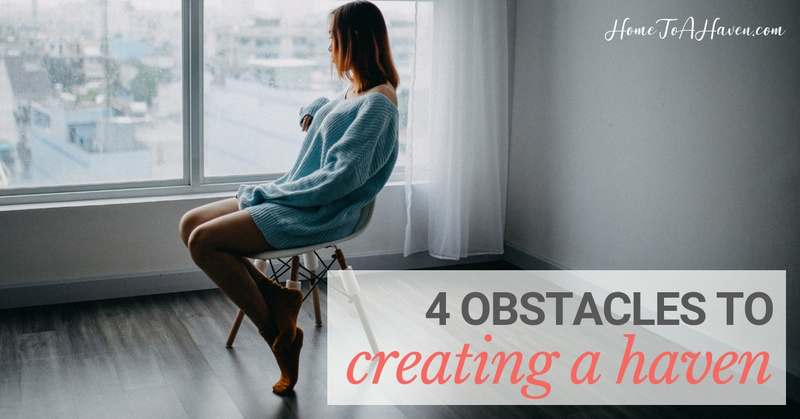 As much as you may want to create a haven, 4 common obstacles may be in your way. Everyone longs for a haven. And you might even try very hard to create one for yourself or your family. But you may feel like you’re at a sticking point, wondering where to begin. Or as much as you try, you just feel stuck. Call it too much clutter, call it too much junk … whatever it may be, too much mess in your home is the first thing that has to go. 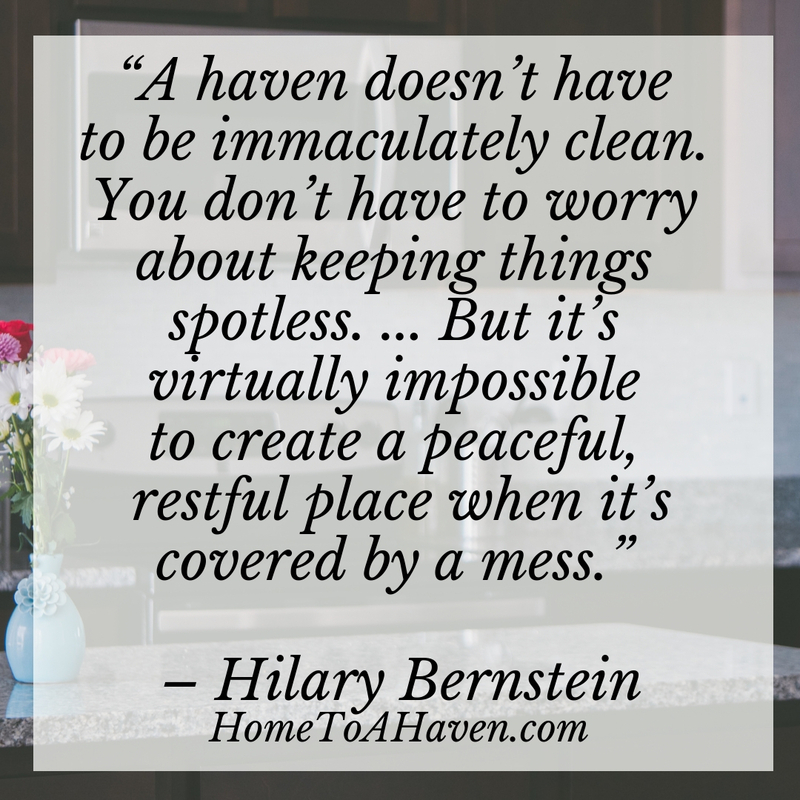 A haven doesn’t have to be immaculately clean. You don’t have to worry about keeping things spotless – at all. But (and this is a big but!) if your home is filled with messes – if your floors and surfaces are covered in piles of clutter – it’s going to have to go. 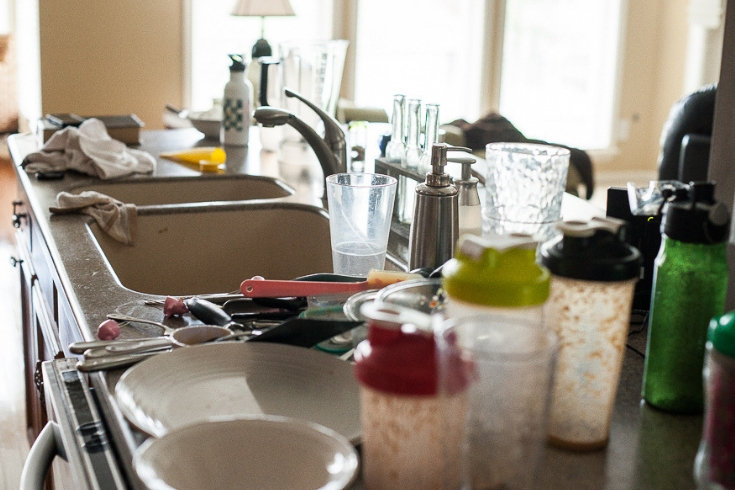 It’s virtually impossible to create a peaceful, restful place when it’s covered by a mess. I know all too well how very difficult it is to take extra time to declutter or clean. And you don’t want to feel like you’re spending a lot of time cleaning. I understand! But it still needs to be done. If you need to do the hard work of decluttering or dejunking your house before you can even get to cleaning it, then you’ll need to set aside specific time for this project. 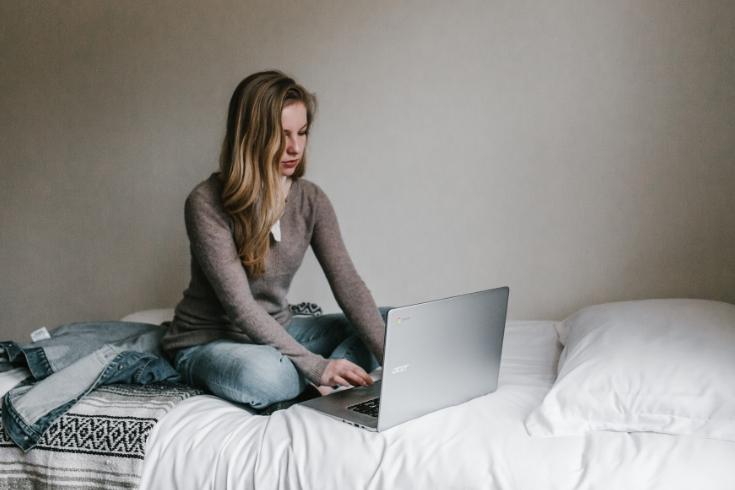 So you don’t get overwhelmed at the prospect, set aside a chunk of time each day – whether it’s 5 minutes or 25 minutes or 45 minutes – and focus on one area of one room. Work at decluttering that single space, getting rid of what you don’t need, want or love, and putting everything else where it belongs. Once you do that, repeat with a different area in the same room the next day, slowly and methodically working your way around that one room – and then another room and then another room, until you’ve tackled your entire home. Sometimes, even if your home is clutter-free, you might get frustrated with a lack of inspiration. How can you create a haven if decorating isn’t your strength? What styles resonate with you? Which colors catch your attention? How can you copy certain window coverings or furniture? What accessories fit your personality the best? Once you have a better idea of what you like, think of ways to copy it. Is there anything in your home that you already own and can use? Keep on the lookout when you go shopping … make a list of what you’d like to add to your room, and watch whenever you’re in a store. If you frequent thrift stores or garage sales, what can you find that can be transformed with a coat of paint? Gather whatever elements you’d like to try (this doesn’t have to happen right away … let it happen over time, if necessary) and then start transforming your home, room by room. You may have a clutter-free home, or all kinds of ideas you’d like to try in your home – but you simply don’t have enough money to make it all happen. 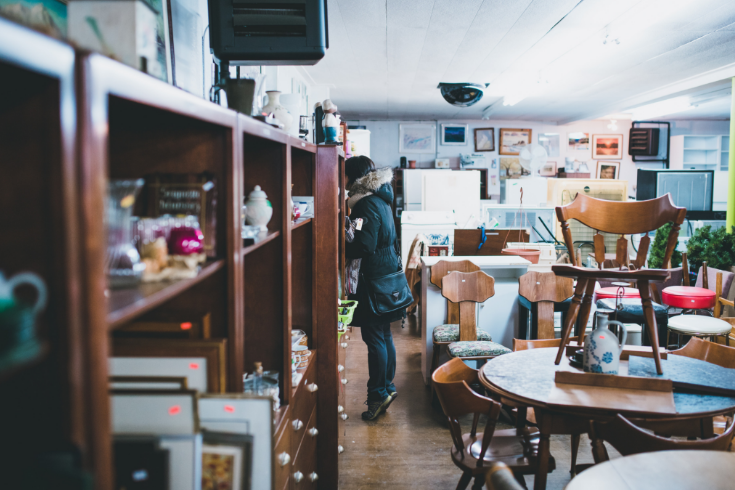 Search for possibilities in thrift stores. Stop at garage sales and estate sales. Keep looking for good deals, knowing that you may need to use a little creativity to transform pieces into what you’d like. But eventually, everything will come together. Another big obstacle you may face simply involves not having enough time. You know you want to create a haven. You may even know what you want to do differently in your home. But you don’t have time to do the actual work, whether it’s cleaning and decluttering, shopping for new additions to your home, or changing anything to your home. For example, it can be one thing to know you want and need to change the pictures in a specific room, and a completely different thing to actually change them. Especially if it involves choosing new ones. If this obstacle stands in your way, there’s only one solution: make the time. Of course we all have the same number of hours in each day, but this simply means making haven creation a priority. This may mean clearing your calendar for a weekend. It may mean setting certain days or times aside for a little productivity and TLC. It may mean saying yes to caring for your home and no to watching TV or letting social media zap your evening. But it will be worth it. As you free up your schedule to work on your haven, you’ll notice a big difference in your home! As you recognize the specific problems you face, and then figure out ways to overcome those obstacles, you’ll be on your way to creating a haven in no time! What obstacles do you face when trying to create a haven? All images courtesy of Unsplash, AdobeStock and PicxClicx. I think not enough inspiration is my biggest obstacle to creating a haven. I have always been terrible at decorating and I think with the right inspiration I can finally turn my home into a haven! Thank you for your encouragement! My biggest problem is I have junk rooms, places I intend to tackle “sometime “. Well your comments breaking it down into smaller pieces makes so much sense. Again, thank you! I have a junk room too, Elizabeth! And I understand … like you, I always intend to tackle it. In fact, I intend to just put things in the room for just a moment until I get a spare minute to put it away. But after a few busy days, everything starts to pile. Then I always have to spend more time unjunking the room. Wow! I appreciate your understanding. Thanks again. Time and commitment to starting. I just need to make decluttering a priority. I also have to get realistic about my ideal image of organization. It is not going to look like an IKEA catalog with our large family. I need to declutter , just thinking about it makes me tired . I don’t have much space to keep the things that are sentimental . I think I need inspiration. I’m not gifted with the decorator gene. So I need help with ideas and creativity making things work. I also don’t have expendable income. I feel that when I spend money, it needs to be on something that I love – not just something to get by. The problem is that I can’t find something I love. We live in a rental home, so I can’t change anything to fit what I need. Thank you for the insights. I’m an empty nester. It is just the two of us now. We raised four kids. During my ‘mom’ years I did not make the time or put much thought into making our home look like the inside of a magazine. My difficulties I believe stem from a lack of decorating know-how, finances, and items gifted, inherited, made, not to mention passed down to both my husband and myself. Very little of it truly reflects our individual tastes. We choose not to rent storage space and live in a small cottage type home. We both dislike the mess/clutter but feel at a loss when it comes to trying to make our home more of a haven. Thank you for sharing your journey with us and for the encouragement that in time, we can have a peaceful haven of a home! First of all, thank you for your wonderful online ideas and support. I love getting your emails and the Facebook group. My biggest obstacle is overcrowding. We live in a small 3 bedroom home. In it live my husband and I, our youngest biological daughter & her baby ( our granddaughter) and our foster daughter. I am in the process of radically decluttering and trying to give on top of the never ending housework and laundry etc! My second largest obstacle is lack of money as our income pays our bills and groceries and travel costs – there is not much left over to purchase decorative luxuries or new storage solutions. My third obstacle is tiredness and feeling overwhelmed. 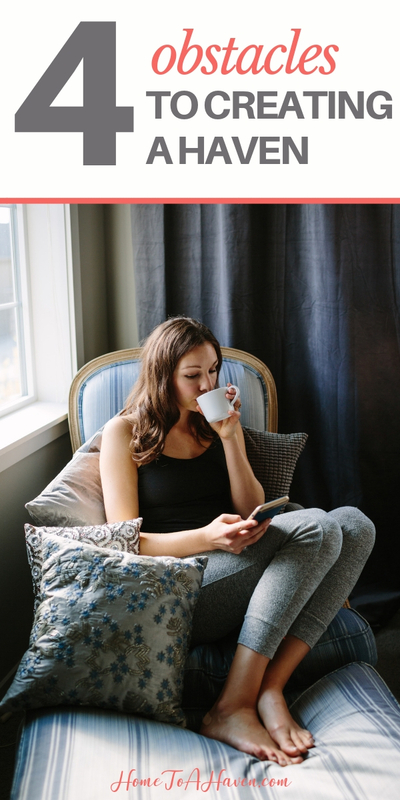 I love to have a little downtime either with just my husband or by myself ….but this hardly ever seems to happen. I’ll get the living room set up exactly as I want it. It’s like Pinterest! The chairs with throw pillows, a tray with books and a candle on the ottoman centered as a coffee table, a blanket draped over one end of the sofa…and then my children, 4 rambunctious boys and a 2 year old dancing princess will enter the room. I blink. Now there’s a dumped tray, pillows flying, ottoman turned on its side as a shield and a blanket fort instead of my inviting sofa. Haven no longer. Sigh. How well I know this feeling! Were you in MY living room last night? ;) I’m learning that even if I can enjoy a haven for a few moments – early morning or at night … when the kids are in bed – it still adds so much calm to my day. I’m with several people in this discussion. Clutter – whether it’s a junky drawer, sentimental stuff on the fireplace mantel or a whole room – is literally an obstacle that quickly piles up and gets in the way of havening. I try to work on creating the haven one corner at a time but sometimes progress seems so slow or it easily gets messy again. Thanks for your inspiration and encouragement for this continual work.